What is your favorite trail to ride? And I’m going to define “trail” very loosely here: any path, lane, way, rail-trail, or track that allows bikes but not motorized vehicles (bike path alongside a road counts!). So whether you ride “trails” on a road bike, mountain bike, hybrid bike, recumbent, or any other type of bike, I’d love to hear what your favorite is! I have several favorites, depending on the type of riding I’m doing. If I’m taking the kids for a ride, maybe even as a bikamping trip, I love the Chesapeak and Ohio Canal Towpath. This nearly perfectly flat trail stretches from Cumberland, MD to Georgetown, DC. 185 miles long, with many places to get on. My favorite ride to do with the kids is to park in Shepherdstown, and ride the 12 miles to Harpers Ferry. We’ll pick up some lunch and ice cream before heading back. If we don’t have time for 25 miles, we’ll park at Brunswick, MD instead, for a total ride distance of about 12 miles. 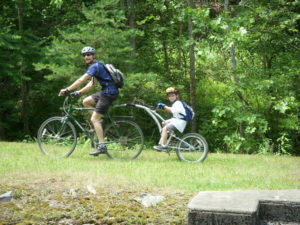 This is a great online resource for the C & O Canal: Bike Washington’s C&O Canal Bicycling Guide. However, as much fun as it is to take the kids riding, I really enjoy pushing myself on singletrack on the mountain bike. There are so very many awesome trails around for mountain biking, but my favorite for many years has been the Southern Traverse outside Harrisonburg. I first explored this trail way back in about 2007 when I learned about it on the IMBA (International Mountain Bike Association) website. It is designated as an Epic, and it definitely lives up to that billing! 36 miles around, with about 3,600 feet of elevation gain over the course of the ride, it is a monster of a ride! The trail runs along the ridgeline, and is often very narrow. Only a few rock gardens, but having to be on point constantly on the narrow trail will test your mettle. I have ridden this trail at various times of the year. I prefer late fall after most of the underbrush has died off (I went in July one year, and it was not pretty! I got so torn up by stickers!). Here is the ride listed on IMBA’s site: Southern Traverse Epic Ride. So what is your favorite trail? Comment on the Facebook post!